I am new to this forum and this field. I am looking forward to good criticism and tutorials/links/instructing suggestions to build a nice system with as less effort as possible while achieving all things I want to have. The main hub is the raspberry pi (newest v3). provides an image stream which can be previewed or stored. So, why all this hassle if everything is basically running already on 1 machine? Finally, I want to still have the possibility to connect a screen to one of the raspberrys and directly have a GUI running on it. Therefore I will modify my existing GUI by outsourcing the executing code. Having the possibility to run the GUI directly on a raspi of choice inherently leads to various problems with the new setup. Just to mention 1: streaming the Raspicam-data to ip and reading it out with the streaming device might be slow or impossible. Here (e.g.) I am thinking to implement a workaround that uses different code decided by MQTT if topic-subscriber and content-poster is the same device. Looking at your design diagram, I’m assuming that is what you are thinking of building (noted that some part are already there). I’m going to try and answer based on that. What do you think regarding speed and efficiency of this setup with respect to the different tasks? It could be a lot better. Do you see any major mistakes in my reasoning and approaches? Yes. The first thing I notice is you are not making full use of MQTT. MQTT is a message broker and a very good and fast one. Consider moving it to be the centre of all your communications between different sensors, computers, servers, phones etc. Have everything talk MQTT. followed by either in or out with in being the device listens for messages and out is where the device sends messages. This will allow other things to listen to what interests them through the topic wild card methods eg to listen to all humidity sensors in the house you use house/+/humidity/out, so any humidity readings will be received. As the Arduinos have the init routine to be used correctly, it is good to have 1 instance running per raspberry with all the parameter etc as active objects. Do you see a more code efficient, stable and faster approach instead of writing my own python-server? As suggested in the answer to the previous question, I would have the Arduino’s (assuming they are actually ESP’s) use MQTT directly which they are very capable of doing. Not the answer you're looking for? Browse other questions tagged mqtt networking raspberry-pi wifi arduino or ask your own question. 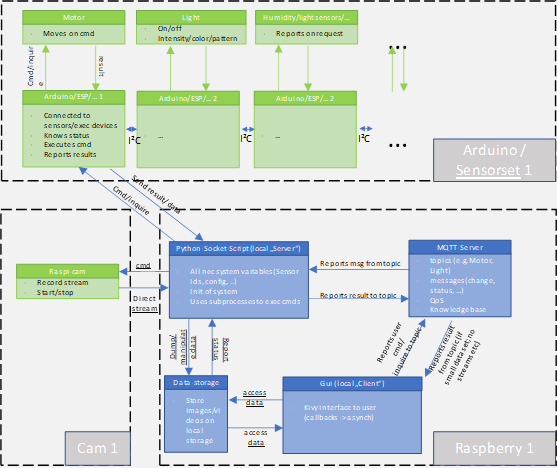 How to access camera feed of Raspberry Pi out of a local broadband network? Are there MQTT servers which allow for message log and retained messages TTL?